For the benefit of the child – does this have to be? The 6. chamber of the administrative court Ansbach under the leadership of the president judge Deininger at the administrative court refused the complaint in a cost reimbursement dispute between the county Donau-Ries and the county Ansbach. The county Donau-Ries was ordered by a court ruling in Sept.1,2015 as a temporary supplementary guardian for a – now 11 year-old child – from the Twelve Tribes community. The complainant asked for help in form of full time foster care from the county Ansbach and brought this child in the knowledge of county Ansbach to a foster family in Ansbach on Nov.9,2013. Just a few days later by order of the supplementary guardian through the district office Donau-Ries the child was picked up from the foster family and brought to a children and youth home. On the same day the complainant informed the district office Ansbach about the move of the child from the foster family to the youth welfare institution and applied for cost transfer. The involved parties now disputed, who would bear the costs of the accommodation of the child in the children and youth welfare facility. The court rejected the complaint. Regardless of the question, which youth welfare office was responsible for the help in the case of the concerned child based on the constant change of residence of the family, the complaint was not successful because the removal from the foster family to a stationary institution for youth welfare was not in accordance with the legal requirements. Even though the child expressed the desire to be taken out out the foster family again or diverse discrepancies, there was no sign of child endangerment that would have made a rash interference of the complainant without involving the youth welfare office Ansbach necessary. There was no urgency to for the removal and the complainant didn’t observe the rules for changing the assistance. The costs for this self-obtained measure does not need to be taken on by the defended county Ansbach. For the Well-Being of the Child — does this have to be? For the well being of the child – does this have to be? …at the medical examination what we already know is determined. Our daughter, Merea, has good health – physically and mentally. There are no signs of abuse. She was not neglected. From the beginning until now she has not stopped to express her desire, to be allowed to go home. Nevertheless: The girl stays in custody; the contact to the parents is prevented. After two weeks she suddenly arrives at home at 7 o’clock in the evening – she ran away from the foster family. The youth welfare office insists that we would hand her over immediately, with threats of violence. This is the second time she is taken out of her bed under police supervision and brought back to the foster parents, crying. Everything “for the well being” of the child and in the name of non-violent education. After the hearing she is disappointed, she feels interrogated. What is going on here? It is a long time and the girl is losing courage. After her first failed escape to her parents, she put it in her mind to flee to Switzerland. There she has various relatives. Arriving at her grandmother, the Swiss girl slowly recovers from the traumatic experiences. We arranged a meeting with the Swiss child protection office. Even though I would have rather talked to them still on Friday, they confirmed me that there is no hurry. So we agreed upon Monday. We are happy a clearing to our situation is in sight. Also our lawyer confirmed, that at this point we don’t need to fear a police action and that according to the Swiss constitution no Swiss citizens is allowed be handed over. What happened now is connected to greatest pain and horror, for me and my family. On Friday morning, November 8, 2013 we leave our beloved daughter with her grandmother, while we went to look at several apartments. Together with her grandmother they want to bake bread and cake. We are all relaxed and look forward to the Sabbath. It seems that slowly things go back to normal. It is about 3 pm. The cell phone rings – unsuspecting I answered it. My disturbed older daughter and loud crying and screaming are heard on the other end: “The police are here, they are getting us…” In an outrageous and violent police action our daughters are being dragged out of the home of my respectable mother, crying and screaming. I don’t understand how this action could happen for the well being of the child in the name of non-violent education. We, parents stayed behind alone. The responsible police man praised our brave attitude. It was a derision. What could we do in face of twenty or more armed officers? During the long ride at night the girls had to bear the sarcasm of certified pedagogues for hours in separate cars, until they were locked up in youth protection facilities. The court in its ruling admits that there is no evidence of abuse in the children. On the day of the seizure by the state the doctor found that no signs of physical or any other kind of abuse; the courts could neither find any damage. According to the courts conviction the impending chastisement in the future, are chastisements that do not leave marks. In its reasoning the court takes the position that all spanking is abuse. The Jugendamt handbook says that all spanking is not abuse: corporal punishments that are connected to afflicting a little force or violence, that don’t hold any risk of injury, and obviously serve as an educative purpose, are clearly to be differentiated from abuse and are regularly not connected to a damage of a child’s welfare.1 This supports what Parliament made clear in 2000 that the intent of the law was not to criminalize parents who spank – much less that they would lose their child custody. The constitutional court will have to answer important questions for all the parents, whether the custody can be taken from parents due to conviction of the court that there’s impending corporal punishment, that doesn’t leave marks, if the parents indisputably raise their children with love, affection and a good example. According to the reasoning of the OLG Nürnberg that does not matter, and all parents who by some educative reason might spank, could lose their child custody. As the press release of the OLG shows, it treated the parents mainly as members of the Twelve Tribes. The withdrawal of the custody is justified identically for both families. It is a matter of individual families and individual parents, which differ in many ways. They have the warranted right to be treated and judged as individuals, especially before court. The thing they have in common is that they belong to the Twelve Tribes. The OLG Nürnberg bases their justification of the withdrawal of custody on that. It even states clearly that, unless the parents would give up their religious responsibility they could not regain the custody over their children. The affected parents see themselves as persecuted for their religious convictions and robbed of their children. 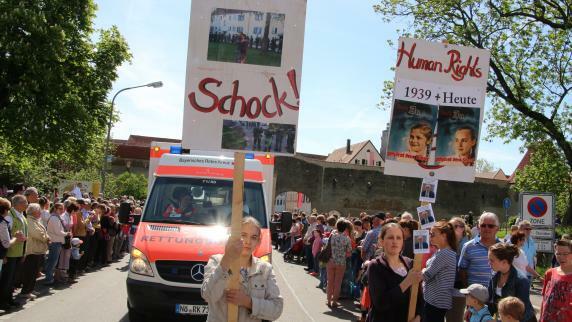 The behavior of the press confirms this suspicion: The press release of the OLG Nürnberg is being spread without even attempting to give the parents a chance to make a statement. The parents are not represented as individuals and bearers of constitutional rights, but vilified as cult-parents through guilt of association. According to the international criminal law genocide is committed by the one who forcefully takes away children from a religious group, in order to completely or partially destroy the group. Does the collective removal of all the children of the community of the Twelve Tribes, from the infants up to almost adult youth, without concrete evidence of an endangerment of those children and youth, and their religious re-education in state custody not fulfill the fact of genocide?3The Constitutional Court will have to answer these questions. If these question are not answered by the German constitutional court, how can ordinary citizens know when they violate the law? By the court’s reasoning every Catholic in Germany who believes what the Pope said about spanking should have their children taken away. Guilt by association is a violation of a basic freedom according to the Basic Law. President on her knees in front of a collapsed parent. Not the cause to win, not the emotion. Only the humanity! European Parliament opens for the ill-treatment of children, parents and parents by German youth welfare offices (Jugendamt) and the system of German Justice. Brussels / Keltern-Weiler.Heartbreak that could have been experienced nowhere else. In no movie you would ever be able to turn out a scene that would have seemed more authentic than what happened yesterday in Brussels, the heart of the Committee on Petitions of the European Parliament. In her presentation, a mother collapsed whose child had been stolen by the youth welfare office. A deputy and Andrea Jacob came equal to the aid. The President of the Committee on Petitions, Cecilia Wikström, left her place, hastened to meet the mother, led her out of the hall and she mothered. In the hallway she was kneeling, as though in front of a child deprived of mother, held her in his arms and soothed her until she could again began to breathe calmly. Breathe calmly. We know what happened! Breathe calmly. were the words with which she managed to relieve the pain —the pain of separation from her child, which was activated in the description that was so deep, so deep that nothing was left. Nothing more. Yesterday the European Parliament, many MPs were present, who had heard the cry of the mother for her child. Deep dismay shot through the hall. Testimonies of the torture of parents and children are getting louder. Tears streamed from the eyes of those who had experienced the suffering as well as the mother Lorrelay Reggentin.